Chennai, January 24: Going beyond her responsibilities, Defence Minister Nirmala Sitharaman interacted with some young beneficiaries of Government’s Ayushman Bharat scheme. 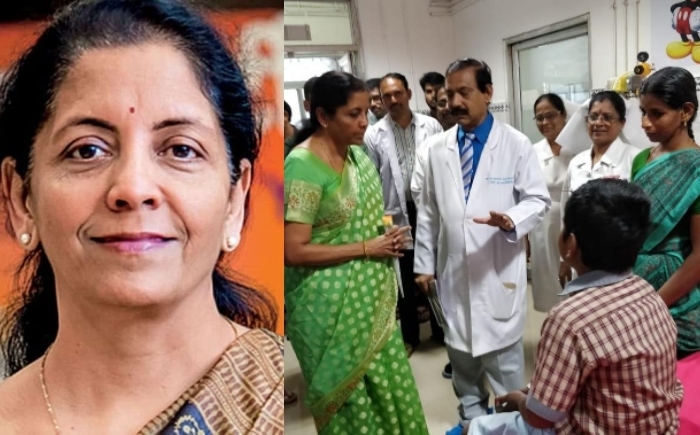 Sitharaman visited Institute of Child Health and Hospital for Children at Egmore, Chennai on January 23. From neonatal severe condition to Autism, heart surgery to liver malfunction, comprised in the children who received exhaustive treatment. Ayushman Bharat provides cashless & paperless access to services for beneficiaries. It reduces catastrophic expenditure for hospitalization and mitigates financial risk so that every citizen can get quality health services without financial hardships. Ayushman Bharat Yojana is a centrally sponsored scheme launched in September 2018, under the Ayushman Bharat Mission of MoHFW for a New India 2022 by Prime Minister Narendra Modi. It aims at making interventions in primary, secondary and tertiary care systems, covering both preventive and pro-motive health, to address healthcare holistically. While interacting, Sitharaman enquired if the children are receiving proper treatment under the Pradhan Mantri Jan Arogya Yojana. PM-JAY covers more than 10.50 Cr families & 7 Lakh have already benefitted so far. This ground level interaction by the Defence Minister surely brings the centre closer to understanding the beneficiaries. PM-JAY’s goal is to create 150,000 such centres.